Dating late 18th Century, Qing Dynasty. left hand index finger missing, otherwise very good condition. minor tear and wears consistent with its age.,see pictures for full details. The goddess of compassion sits at ease on a lotus throne adorned with jewellery and with an ornate crown. Tears and wars consistent with its age.see pictures for full details. Region of Origin: China Primary Material: Bronze Original/Reproduction: Original Material: Copper bronze Size: Height 13.0 cm . Length 9.0 cm . Breadth 4.2 cm Weight: 0.45 KG-included the weight of packing materials New,i do our best to provide an accurate description and realistic pictures. But colors may appear slightly different to each user due to individual monitor settings. I will try my best to resolve the problem. Primary MaterialBronze Gilding & Turquoise. we're confident that you'll love our services. A fine quality 19th century Chinesebronze Buddha Shakyamuni. The Buddha has a peaceful countenance with downcast introspective eyes and a firm brow. His earlobes are stretched long from a youth spent as a prince wearing heavy gold earrings. 17 cm high 9cm across. Information about Shakyamuni Buddha. This Particular Statue is made in Patan district. Patan is a historical city of situated in Kathmandu Valley, capital of Nepal. There are lot of labor and different materials to complete it out. Antique Vintage Chinese Bronze seated Buddha Figure / Statues x 2. Material Copper Bronze. Condition:Very Good. Weight: 1000g. CHINESE 18th CENTURY KANGXI ERA. SIGNATURE / SEAL CAST IN BASE OF STATUE. ACQUIRED FROM AN AFFLUENT CHINESE FAMILY RESIDING IN SAN FRANCISCO SINCE THE "FIRST PERIOD" IMMIGRATION IN 1849. 100% ORIGINAL. Bronze is made of bronze (copper and tin alloy) made item. On behalf of the birth of the Bronze Age civilization. Because bronze throughout the world, so it was a symbol of a worldwide civilization. Buddha Antique Japanese Kannon Kwan Yin Gilt Bronze Statue 23” Late 19th C.
This is a Beautiful Antique Japanese Kannon Kwan Yin Gilt Bronze Statue. Subject is standing on a lotus base, dressed in elaborate layered robes, holding. Exquisite! "Bronze Wall Mask of Kwan Yin"
This is a wonderful bronze casting of "Kwan Yin". It is in"Excellent Condition". I'm glad to introduce this, From the pictures, you could see it is very nice, high collection or as a gift to your friend! He is holding a Koi fish which is a symbol of wealth and luck. It has a mark on the bottom either from the foundry where. This is a great piece of valuable collection, a valuable personal alter or a very good present. the handwork is very fine with incredible detailing. Don't miss out this chance to get it. Wish you good luck! Here is Collect Tibet Bronze Kwan-yin Ksitigarbha Shakyamuni Buddha Lotus Bowl Sculpture. the handwork is very fine with incredible detailling. Don't miss out this chance to get it. Wish you good luck! We hope cooperate with you in the future. We will do as we promised for you. It dates from early 1900's. We work hard to find interesting and hard to find collectibles and antiques. We do our best to correctly represent the condition and color of each item in the photos but keep in mind monitor screen colors can differ. We very glad to solve all problem with you. After Service. A good looking and decorative pair in lovely order throughout, these are export pieces so made for the export market most likely around the 1940's. There are multiple high definition super-sized pictures at the bottom of this page. Kwan Yin on Crescent Moon. She is depicted here in the royal ease pose and seated upon a crescent moon. The Buddhist 'Heart Sutra' is engraved on the moon in Chinese script. KWAN YIN STATUE. This is a cold cast resin statue of Kwan Yin that is fully plated with bronze and hand painted accents. SEE OUR ENTIRE SELECTION OF HIGH QUALITY KWAN YIN STATUES IN THE 'KWAN YIN ' SECTION OF OUR. This is a cold cast resin statue of Kwan Yin that is fully plated with bronze and hand painted accents. WATER & MOON KWAN YIN DREAM CATCHER. From Mr. Maza.H.Laguanash Family. when my grandpa working there as a lower. 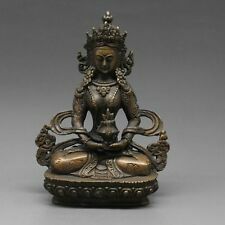 Hier ist10" Tibet Bronze Gild Buddhist Green Tara Göttin Buddha KwanYin Statuen Skulptur. Wie Sie das Bild sehen können, ist es in gutem Zustand und wurde von erfahrenen Handwerkern im traditionellen Stil mit feinen Handarbeiten geschaffen. Chinese Old Bronze Collection Handmade Carved Buddha Statue. I must glad to resolve it friendly. Goods without item number will NOT be accepted. So all item are not antique ,They are all arts! Genuine handmade. KWAN YIN STATUE. Kwan Yin on Lotus Statue. This is a cold cast resin statue of Kwan Yin that is beautifully plated with bronze and hand painted accents and features a removable willow branch to place in the statue's hand. I am quite glad to help what I can ! This is a great piece of valuable collection, a valuable personal alter or a very good present. the handwork is very fine with incraedible detailing. Don't miss out this chance to get it. Wish you good luck! Information about Shakyamuni Buddha. Features Handcarved. This Particular Statue is made in Patan district. Patan is a historical city of situated in Kathmandu Valley, capital of Nepal. There are lot of labor and different materials to complete it out. High collection or as a gift to your friend! Material: copper bronze. Also note that monitor settings may vary from computer to computer and may distort actual colors. The handwork is very fine with incredible detailling. Don't miss out this chance to get it. Wish you good luck! No exceptions. The handwork is very fine with incredible detailling. Don't miss out this chance to get it. Wish you good luck! No exceptions. weight :1051 g.
Chinese Bronze Buddhist Figure of Kwan Yin Mudra.